Created by a mama of three with a background in industrial design, the Kid Who Can company came out of the idea that it is important for kids to take responsibility for themselves and their home. Famous for their chore charts, The Kid Who Can strives to create simple and functional products for families. A Feelings Chart is a tool used in developing emotional vocabulary for young children. It can assist in helping a child identify how they are feeling. 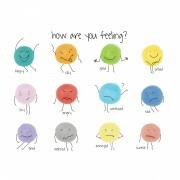 Once identified and named, it is easier to navigate through or appreciate the emotion. Put it in different areas of your home where it will be easy to use when needed!